The schedule will consist of all games and NO practices. League will operate early to mid October through the end of March or early April. One game per week, during prime time. All games will be on Sunday nights in on prime time ice, Game times will be 6, 7 and 8 pm. NO GAMES WILL BE SCHEDULED ON SUPERBOWL WEEKEND AND WE TAKE THE WEEK BETWEEN CHRISTMAS & NEW YEARS OFF. League will operate mid April through the end of May. For our Winter season we'll be operating from centrallly located and rcently renovated Kinsmen arena, for all games. We have allowed players as young as 13 to compete in the Adult division. If their size and ability permit AND they have the right attitude to compete for the fun of the game. While the age gap from 16 to ?? is considerably more than players will be accustomed to in most adult hockey, we have found absolutely no issues with the age separation because everyone fully understands that this is hockey for fun, while the games are competitive, everyone 'gets it'. Our Younger players respect the older players. Please do not let this intimidate you, (especially if you are an older or weaker player) it works fine and everyone has a great time! is 100% accurate and supersedes any flyer and poster information, which may not be current or updated. We reserve the right to move any player playing in a division that we feel is inappropriate for his/her ability, either above or below. 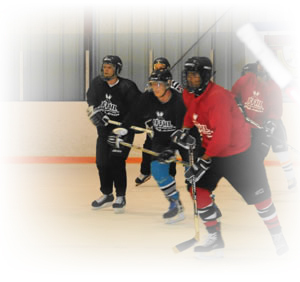 For many adult players involved in the game, their only goal is to get some exercise and have a good time ‘with the boys’ at the rink. Competition is not as important as it once was, but a level of competition is required to make the ice time more exciting and challenging. Hockey should be a social event for these players as well as fulfilling their needs as noted. Our league provides the perfect environment for adult players to get everything they want from the game, yet keeping it in perspective for them. Our one of its kind program promotes interaction with new players and friends alike. As an adult one of the most difficult things to do is create friendships with new people but the makeup of the JFFHL promotes camaraderie and new friendships. Adults often have time restraints and many commitments outside of their sports teams, the JFFHL eliminates the hassle of not being able to play organized hockey because of these commitments. Players may omit specific dates for holidays or any other reason, there is no worry that your team will play short or have to replace you, the league takes care of this on your behalf.